It is a colorful tale of cultures clashing, of love and sacrifice, and most of all, of stunningly beautiful music. 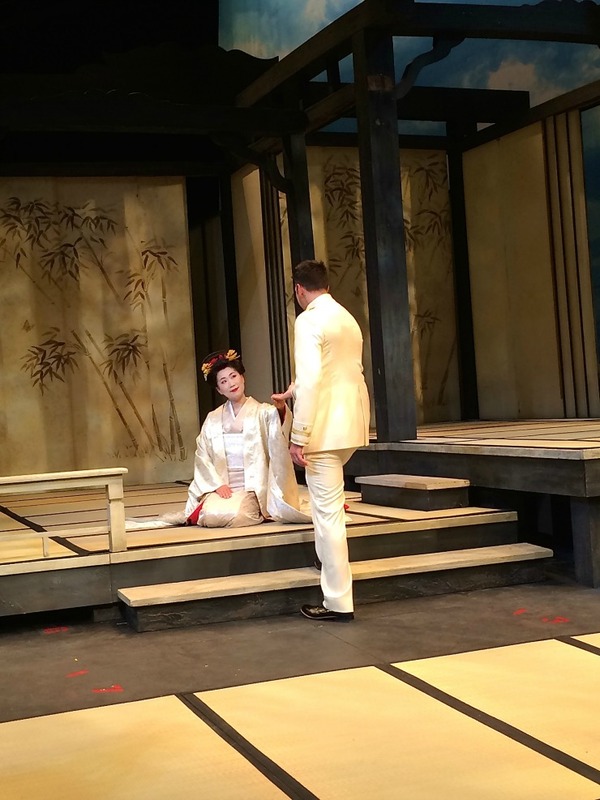 Madame Butterfly is one of the most-performed operas of all time, touching audiences for more than a century with the semi-true story of Butterfly, the young Japanese geisha who marries an American naval officer only to be abandoned by him. The opera is both a visual pleasure and a musical masterpiece, and Utah Opera’s Madame Butterfly did an exquisite job on Saturday’s opening night. 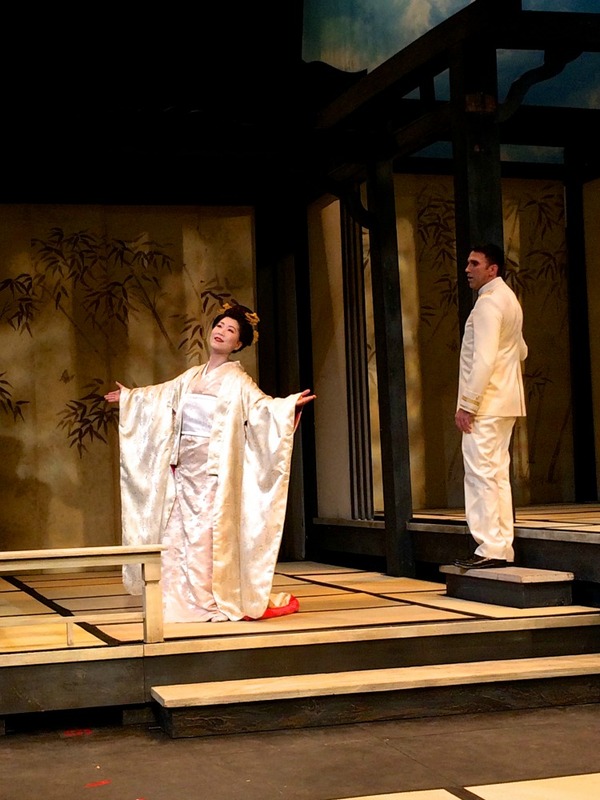 Madame Butterfly transports audiences to Nagasaki, Japan, where American naval officer B.F. Pinkerton has arranged to marry Cio-Cio San, better known as Butterfly. For him, the marriage will be temporary until he finds an American wife, unknown to Butterfly. Shortly after their marriage, Pinkerton returns to the United States, leaving Butterfly and her maid Suzuki behind. Yunah Lee and Eric Fennell at rehearsal for Utah Opera’s Madame Butterfly. Three years later, Butterfly patiently waits for her husband’s return even though Suzuki doubts he’ll come back and the marriage broker keeps bringing new suitors for Butterfly to marry. In Pinkerton’s absence, Butterfly gave birth to their son, named Trouble. The American Consul, Sharpless, arrives with news of Pinkerton’s return, delighting Butterfly. She stays up all night waiting for him to return. It was Lee’s 137 time in the role of Butterfly and its obvious that she has perfected the performance without becoming bored with it. Her acting is convincing and every note is gracefully flawless. In a recent interview, she told me there are still challenges with the role and that she hasn’t mastered it yet. I respectfully disagree. Yunah Lee as Butterfly and Eric Fennell at B.F. Pinkerton. The scenes with Butterfly and Pinkerton, played by Eric Fennell, were full of chemistry and their duets were nothing short of beautiful, although there were several times I wished I could hear Fennell better (especially in scenes with Sharpless, played by Troy Cook). My favorite parts, if I had to choose only a few, were the arias with Butterfly and Suzuki, played by Nina Yoshida Nelsen, another veteran of Madame Butterfly. Nelsen has performed Suzuki nearly 50 times and told me in an interview that the role fits her voice perfectly. I absolutely agree. Lee and Nelsen’s voices together during the tender moments of the second act were amazing. But the real star of the opera is Nelsen’s son, Rhys, who plays Butterfly’s son. The darling four year old’s acting was not only cute, but impressive for his age. 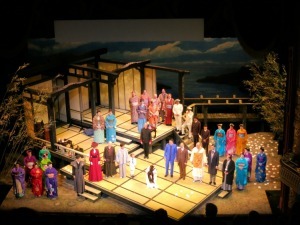 The cast takes a bow at the end of Madame Butterfly on opening night. The set remained the same throughout the entire opera but managed to avoid getting stale with the changing costumes, the excellent acting by the entire cast, and the addition of little Rhys in the second act. The emotional opera is an absolute delight, even if it’s a tear-jerker that ends in heartbreak. You know it’s struck a chord with audiences when they boo Pinkerton’s curtain call, not because of a bad performance but because his character is so cruel. 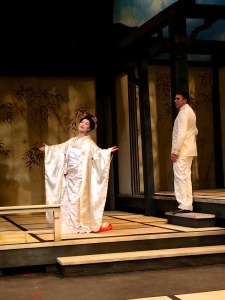 Utah Opera’s Madame Butterfly continues with evening performances on October 13, 15, 17 and a matinee on October 19, 2014. Tickets are available online here and are $15 if you’re under 30 years old (use the promo code UpBeat).